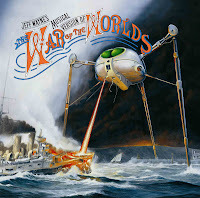 Elvert Barnes TRANCE HEAD: Jeff Wayne's Musical Version of "The War of the Worlds"
One of the best and most important electronica albums of all times is Jeff Wayne's Musical Version of The War of the Worlds, a 1978 concept album by Jeff Wayne, retelling the story of The War of the Worlds by H. G. Wells. It has since spawned multiple versions of the album, a computer game, a DVD, and a 30th anniversary live tour. Click the album cover to read the entire article at Wikipedia. I've included two excerpts from the album in my September 2010 "Magnetic Fields" New Age / Trance Mix.